Is there a demo or trial version of HMI Droid? No, there is no demo or trial version. You can apply to become a beta tester and test new releases of the iOS-version of the app for up to 90 days. Is it possible to purchase HMI Droid directly from IDEA-Teknik? No, HMI Droid (Odrid HMI) can only be downloaded on Google Play, Amazon Appstore or Apple App Store. The development tool HMI Droid Studio can be downloaded in the download tab or on the Microsoft Store. When will feature X be available? Hopefully in next major release. Information about updated versions is published in the version history. Please subscribe to our YouTube channel for latest news about HMI Droid (Odrid HMI). HMI Droid Studio connects to the PLC by I get no connection from my phone. This is (normally) a network problem. Make sure the phone or tablet is connected to the same LAN as the PLC. Use a Ping or Traceroute app to verify that you can reach the PLC. Some common mistakes: Wrong IP-address, phone connected to guest network with restricted access, network configuration in PLC is missing default gateway, VPN-tunnel not setup correct. Other possible reasons: Corrupt *.led file, broken app, faulty iOS or Android device. How do I connect HMI Droid (Odrid HMI) to my PLC over Internet? Just make a port forward in your router and connect to your public IP-address. Use a VPN-tunnel. Many routers contains VPN-servers and the Android and iOS-devices have easy to setup built in VPN-clients. Is there a PDF file of the manual I can download? How long will HMI Droid be supported? 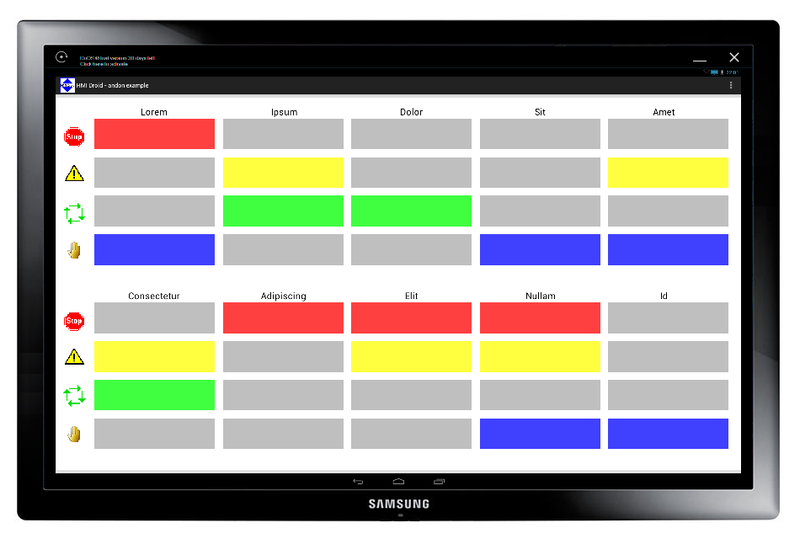 Can we purchase a customized version of HMI Droid (Odrid HMI) for distribution directly to our customers? I have enabled the full screen mode. Now I can not open the options menu. I have created a project in HMI Droid Studio. How do I distribute the HMI/SCADA solution to my customers? Is it possible to use a hostname or domain name instead of an IP-address in the communication settings? Is there a "Hello World" example? Can I run HMI Droid on a PC? Is it possible to switch the HMI Droid on the Android device to fullscreen? What do I do if I need a special function or adaptation? Can I use HMI Droid on devices other than mobile phones and tablets? No, but you can very easily create a PDF file of virtually any web page with e.g. Google Chrome. HMI Droid is a Long Term Support app. Hopefully we will release updates and provide support at least until year 2028. For best reliability, we strongly recommend using the Android version of the app. New versions of iOS may cause the app to stop working. We will try to resolve any issues, but publishing updates for the iOS version of the app is a very slow process. No, unfortunately we can not offer such solutions. In the Full screen mode on devices with no menu button, you can make a tap and hold for 3 seconds in an empty area of the screen to open the options menu. If using the Full screen mode, you can insert a Button with the Action Open options menu. Watch example on YouTube. Your customers have to download the HMI Droid (Odrid HMI) app on Google Play, Amazon or App Store and then install your panels (pages) and any other files like images and text files in their devices. Yes, many customers use HMI Droid with e.g. DynDNS services. Note: This example will read Modbus Holding register 0 and can be used with most PLCs. However, some gateways e.g. the Schneider Electric SR3NET01BD do not support access to Holding register 0 and the addresses in the panel (page) may need to be changed. Yes, you can use Android-x86 or an Android-emulator like e.g. BlueStacks 2 or AMIDuOS. Installing Android-x86 in a virtual machine using e.g. Oracle Virtual Box is a fairly simple task and it can be used with both Windows and Linux PCs. Please contact us if you want to try a Beta version of HMI Droid for Windows. Watch short YouTube movie here. Yes, this feature is available from V1.6.2 and activated in display preferences. Note: Support for full screen mode is not available in the iOS version of the HMI Droid. The update is normally performed automatically unless manually disabled or if no internet connection is available. Get in touch with us, we try to successively add the features that are in demand. Yes, you can use e.g. a media player, a PC with Android-x86, a Panel PC or a Raspberry Pi with Android. It's also possible to run HMI Droid on Chromebook. We normally respond to support emails within 12 hours all days of the week. Please do not post any support questions as reviews on Google Play, amazon Appstore or Apple App Store or as comments on our YouTube channel. General questions about HMI Droid (Odrid HMI) will be answered within two business days. Note: Make sure to use a valid email address when sending support questions. I have problem installing HMI Droid Studio from the Microsoft Store. Please use the link below for advice from Microsoft. Fix problems with apps from Microsoft Store. Unfortunately, we can no longer publish any updates that works with older iOS-devices. From 2018-07-01, all new or updated apps for iOS-devices must be built with the iOS 11 SDK. Odrid HMI 1.2.33 and all earlier versions were build with the iOS 7 SDK and workes with a larger number of iOS-devices. I'm trying to download the app but my payment is declined. Try using another payment method. If it still does not work, please contact Google, Amazon or Apple. How do I purchase and install HMI Droid from Amazon Appstore? Why is there a message "File 'start.led' not found. Use HMI Droid Studio to create the first panel (page) start.led and then transfer the file to the work directory of HMI Droid." when you launch the app after installing it? This is fully normal and the message appears when there is no panel "start.led" in the app's work directory. Use the PC program HMI Droid Studio to create the panel (page) start.led and store it on the PC. Then transfer the file to /Android/data/se.ideautomation.hmidroid/files/ in the Android device using suitable method (Dropbox, USB cable, e-mail attachment etc). If I want to install my HMI in many mobiles do I have to buy other licence? License is per user and it should be possible to use your Google Account to install the app to several devices. HMI Droid purchased on Google Play after 2016-07-02 can be shared with up to 5 family members using Google Play Family Library. Why can I not install the HMI Droid on my Android phone? You must have Android version 3.2 4.0 4.1 or later to install HMI Droid. Note: Paid apps are not available in all countries. When I import my main screen "start.led" it gives me the following error Incompatible file version . Some pages are not displayed on my Android-device. Instead there is an error message about a missing start.led file? My computer detects a virus in HMI Droid Studio. Is the file infected? Why are some texts truncated even though I have enabled the "Fit width and height option"? Is it possible to use LEDs and bitadressing with register number greater than 4095? Is there an example for using the 'As Text' format? Is it possible to display the high and low bytes of a 16-bit word? How is the Control word with life bit addressed on a Siemens S7 PLC? How is the Control word with life bit addressed on a PLC that uses Modbus? How do I enter the bit address for a boolean variable? How do I transfer the panel-file from the PC to my Android-device? How do I read Modbus Input Register 30001? When I try to change a variable in the Test panel mode, I get a "Not implemented!!" error message. Why? Is Bluetooth supported in the Test panel mode of HMI Droid Studio? How many objects can be inserted into a panel? I have created a panel but when I copy the panel to the HMI Droid, it is not visible. It just gets gray. Why? Can you have different orientations on the panels? Is there a panel size that fits most phones? Why do my images not appear on the device? I have a variable that contains a temperature in degrees x 0.1, ie the value of 235 means 23.5 degrees. Can you get the Droid HMI to display a decimal point before the last digit? You are probably using an old version of HMI Droid with a new version of HMI Droid Studio. Please update the app to the latest production version. If you have downloaded the HMI Droid (or Odrid HMI) app from Google Play, Amazon App Store or Apple Appstore, the app will be automatically updated to the latest production version when the Android or iO-device is connected to Internet over WiFi. Note: If you are using a Beta-version of HMI Droid Studio with new features not yet supported by the production versions of the HMI Droid (Odrid HMI) app, you must use a suitable Beta version of the HMI Droid (Odrid HMI) app. Please contact us to become a Beta-tester. The file name for the panel (page) file must use lower case characters. File names containing upper case characters will cause erratic behavior. Please read section about naming panels (pages) in the manual. My computer detects a virus in HMI Droid Studio. Are the files infected? Many anti-virus programs sometimes makes false positive detections. Please update your virus definitions and try again. Contact us on support@idea-teknik.com for further advice. Now it's also possible to download HMI Droid Studio from the Windows Store. The fonts in Windows, iOS and Android are not identical and the kerning is probably different too. In iOS and Android the texts can therefore sometimes be truncated depending on the contence, the text size and the DPI. The workaround is to disable the "Fit width and height" option for the text object and manually increase the width. Update: In HMI Droid Studio version 6.7.5.53 and later it's possible to disable the "Fit width and height" option for the Date and Time objects too. The bitaddresses are currently 16-bits wide and the highest address is thus R4095:14. From version 1.7.5.75 (Android) and 1.0.10 (iOS) there is a workaround. The LEDs can read boolean data from a Numeric Variable object that shows the register. The address range for bits will be extended to R65535:15 in a future version of HMI Droid. The sample panel is available for download. In version 1.7.5.74 (Android) and 1.0.9 (iOS) and later you can read the individual bytes from a Numeric variable object by using the Objects variable area. The high byte is available at address 16 and the low byte at address 17. How is the "Control word with life bit" addressed on a Siemens S7 PLC? The address is an octal bitaddress and can be calculated by multiplying the (even) byte address in the PLC with 8 and then converting the result to octal. Use the 'Default DB' for the datablock number. How is the "Control word with life bit" addressed on a PLC that uses Modbus? The address is an octal bitaddress and can be calculated by multiplying the decimal address to the Holding register in the PLC by 16 and then converting the result to octal. Bit addresses for boolean variables are decimal by default. To enter the address in e.g. Modbus format (word:bit) or Siemens S7 format (byte.bit) you need to choose the correct address format. 1. By connecting the Android-device to the PC with an USB cable and using the file explorer in the PC. The USB connection in the Android-device should normally be set to File transfers (MTP). 2. By copying the file from the PC to an USB memory stick and then to the Android-device. An USB-adapter might be required and a file explorer is needed in the Android-device. 3. By sending the file as an email attachment, downloading the file and then using a file explorer or the Import command in HMI Droid. 4. By exporting the file from Dropbox to the /Android/data/se.ideautomation.hmidroid/files folder. Choose a method that is suitable for your Android-device. NOTE: After importing a file, the HMI Droid app needs to be restarted to load the file. Press Back once in the start screen to close the app. NOTE: On some devices and when using app versions before V 1.7.5.78, the Import command can cause an ANR (App Not Responding) error. Choose variable area AI (Analog Inputs) and use address 0. All Modbus addresses in HMI Droid are zero based i.e. the first variable of each Modbus data type always has address 0. The Test panel mode currently does not support all functions in HMI Droid. Use the Numeric variable object instead of the Input field object and tick the "Allow change of value" checkbox in the dialog. Formats that currently can be modified in the Test panel mode are 16/32 bits signed and unsigned integer and float. No, the Test panel mode currently only supports Modbus/TCP, Modbus RTU and Siemens S7 Communication (ISO-on-TCP) over TCP/IP but more protocols and connection types will be implemented later. The maximum number of objects in a panel is 65,535 4,096. If the panel (page) is edited using a newer version HMI Droid Studio than the app, the panel (page) will not load. You have to update the HMI Droid to latest version. The *.led-files are backward compatible, it always possible to open an old *.led-file in a newer HMI Droid Studio or HMI Droid but not vice versa. Update: In version V1.7.1.57 (2015-12-16) and later, there is an error message "Incompatible file version" instead of a blank page. No, the panel start determines the orientation to portrait or landscape and the other panels must presently follow this. Ability to change orientation will be implemented later. Update: In HMI Droid 1.7.8.89, rotation of the screen can be enabled. Watch demo here!!. Many phones have a width of the screen of 320 or 360 dp. You can use 320 dp in width for the panels and activate the option center panel on the workspace in the settings. With the automatic scaling introduced in version 1.0.0.30, you can use the panels even on devices with the "wrong" size of the workspace. The image files must be transferred to the right folder on your phone/tablet device either by manually copy the files with a file manager or by using the function import image in the app. The file name can not contain a path, and it must be correct with respect to upper/lower case characters. You can accomplish this function by selecting the format PHYS and specify how the variable is scaled. See table below dialogue on this page PHYS in the manual. You can even include the unit eg °C if desired. Can HMI Droid communicate with Allen Bradley CompactLogix/ControlLogix/MicroLogix PLCs? Can I use a serial port on my Android device or on my PC? Can I use HMI Droid with my Arduino? Can I use Bluetooth in the iOS-version of HMI Droid? HMI Droid connects but there is no communication and I get an error message when I try to change the value of a numeric variable in my controller using a Push button. I can read some variables but the communication stops working if I add more variables of the same type. My Modbus/TCP communication is not stable, it's switched on and off all the time. Is it possible to reduce the speed of the communication? Why does not HMI Droid connect via mobile internet? Why does HMI Droid not connect via Bluetooth, although I paired the devices and did enter the MAC address? 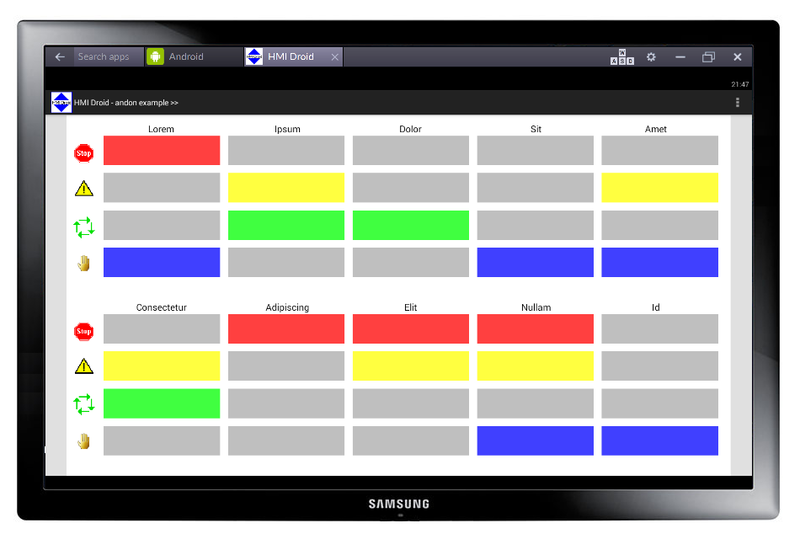 Can you use HMI Droid on a wired network? Note: See the Communication issue checklist in the manual for general advice concerning communication problems. Some Allen Bradley models supports Modbus. Please consult the manual for your PLC. Can I use a serial port on my Android device or on my PC with HMI Droid? Currently there is no support for choosing and configurating a serial port for the connection. However, you can install a software port server on the PC and connect HMI Droid to the port server. Please contact us for further advice. Yes, you can include a Modbus server library in your sketch. Note: If this ModbusIP library is used, the line #define TCP_KEEP_ALIVE in the file ModbusIP.h must not be commented out. No. Unfortunately there is no support for the Bluetooth Serial Port Profile (SPP) in iOS. We have tried Bluetooth LE on iOS devices but the performance is very poor and the current implementation only works with Bluetooth modules that uses the ISSC proprietary service. Watch demo here. The panel (page) must contain at least one object that diplays the value of a variable in the controller to start any communication. The polling mechanism in HMI Droid contains a "look ahead optimizer" that will read large blocks of data if adjacent variables are used in the panel (page). This normally works fine with most PLCs but in some cases it can cause problems e.g. if there is a limit in the Modbus slave for the maximum number of variables that can be read in one Modbus message or if the Modbus variable map contains addresses that can not be read. Try to lower the setting for "Modbus max block size (Reg)", the default value is 55. Please contact us for further advice. Update: In HMI Droid 1.7.8.89 (Android) and Odrid HMI 1.3.0 (iOS), the Optimizer can be disabled in the settings for the app. Make sure the setting for Timeout (Response Timeout in ms) is not too low. The default value is 3000 and normally you should not use a value lower than 3000. The setting can be increased if you are using slow Modbus devices or slow internet connections. If you create your own Modbus server e.g. using an ESP8266, you have to keep the TCP connection open until closed by HMI Droid and not close the connection as soon as a Modbus response message is sent. Please contact us for further advice. Starting with version 1.6 of HMI Droid, it is possible to set the minimum time between two polls to save battery or data traffic. This can be done in the settings for the controller in HMI Droid or in the communication parameters for the panel. The minimum time specified in milliseconds and can also be changed by using e.g. a Slider in the panel connected to system register R64516. There are several settings that are important for it to connect. First, always select the correct link. At the mobile internet will you normally choose Wi-Fi, which really means TCP/IP over Ethernet. (The exception is if you use SattBus, then you should choose Ethernet UDP.) In addition, you should enter the address and port number. These three parameters have to be right for a connection to take place. Use the Diagnostics/Communication command in the menu that displays a dialog where you can see the most important settings. If you entered the MAC address in the panel's communication settings, this will override the address you entered in the settings in the HMI Droid. In most cases, the SPP (Serial Port Profile) option must be selected. Yes, select Wi-Fi that really means TCP/IP on ethernet whether it uses Wi-Fi, 3G or otherwise. How do I change the communication parameters on an iOS device? To access the settings on an iOS-device, press the Home button, then press the Settings icon, scroll down the list and select Odrid HMI. How do I transfer image files to Odrid HMI, it can not be done via e-mail client? To import an image in the iOS version you have to take a detour via "Quick Look". Tap the image and hold. Click on the "Quick Look" icon to display the image in full screen. Tap the image to show the toolbar. Press the "Open in" button. Scroll through the list to find Odrid HMI. The procedure can be slightly different depending on the type of device and iOS version. It's also possible to use Dropbox for transferring image files. How do I transfer a panel (page) file to HMI Droid? Use the feature "Open in Odrid HMI" (or "Copy to Odrid HMI") in e.g. the email client. Watch this YouTube film to see how it works. NOTE: You have to attach the file in the email, using a link to a file on e.g. One Drive or Google Drive will not work! Version 1.0.17 of Odrid HMI has support for iTunes files sharing. After transferring the files, Odrid HMI has to be restarted to reload the panels (pages). Why does ** or strange values appear when trying to read registers in xlogics PLC? In xlogic's PLCs registers with address below 512 are 32-bits in length and address becomes in some cases wrong if you read more than one register in the same panel. Version 1.1 includes a selection between 32 and 16-bit registers in the settings for the controller and this solves the problem. How do I check the status of a function block? Status of the function block or 'Middle Coil' is displayed in the same way as outputs. This means that you should choose the variable area 'Q' in the HMI Droid Studio. You must also choose the protocol "Modbus/TCP class 1" to be able to read and write outputs (coils). Can I access the block parameters in LOGO! 8 from HMI Droid? Use the Parameter VM Mapping... command in the Tools menu in LOGO!Soft Comfort to map the block parameters on words etc in the VM. HMI Droid will read and write data in VM as Datablock 1. The current version of HMI Droid does not support the Byte datatype but bits for Weekday in the Weekly Timer block can still be monitored and manipulated. Note: All Byte, Int, DInt, Word or DWord addresses in VM/DB1 have to be even. Is there a sample panel for my Siemens S7-300 PLC? Can I use HMI Droid with Siemens S7-1200 or S7-1500? The Siemens S7 (ISO-on-TCP) protocol driver in V1.7.2 of HMI Droid does support the S7-1200 and S7-1500. For the 1200, Rack must be 0 and and Slot must be 1. New parameters for Rack and Slot has been added in the settings for controller. Only global DBs can be accessed. The optimized block access must be turned off. The access level must be “full” and the “connection mechanism” must allow GET/PUT. Can I use HMI Droid together with Siemens LOGO! 0BA7/0BA8? Yes, it does work in version V1.7.2 or later of HMI Droid by setting Slot = 0. Please use the following setup for the LOGO!. A ready to use sample panel (page) for Siemens LOGO! is available for download in the News tab. How do I connect HMI Droid to a Siemens S7 300 PLC? There are different possibilities, you can use a communication processor (CP 343-1) or the FB 210/220 function blocks. The Siemens application note "FETCH/WRITE service in an S7-300/400 CPU via the integrated Ethernet interface" contains a detailed description of how to setup the PLC for using the Fetch/Write protocol. How do I access the %MX variables in a TSX 57 PLC? %MX variables are mapped on outputs (coils) in this PLC. Choose Modbus/TCP class 1 and use variable area "Q" for the objects in HMI Droid Studio. How do I access the M variables in an IDEC FC5A PLC? The M variables are mapped on outputs (coils) in this PLC. Choose Modbus/TCP class 1 and use variable area "Q" for the objects in HMI Droid Studio. The first M variable uses address 1000 on Modbus. See table on page 7 in this document.